It’s absolutely impossible not to be impressed by this piece of chocolate magnificence. 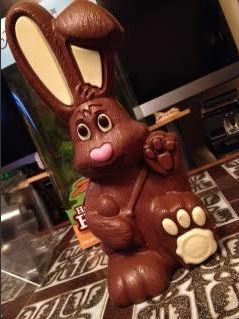 While husband tried to prevent me from breaking in to it, I pointed out that this was not a gift but, in fact, a review bunny and if I wanted to gnaw his face off, nibble his ears or bite his fluffy tail, it was my right as the blogger writing the review to do so. I think he kind of reverted to childhood when he saw the bunny and his only child nature kicked in. “MINE” he proclaimed. “No so”, countered I. “For you have already claimed the 1.4kg Ultimate egg from Fortnum’s and you cannot claim two things. You must forfeit one.” I said. I knew I had to review it and I was super keen to show you, dear readers, how marvellously thick the chocolate rabbit was. Well worth buying for a family. This was a conundrum. As Head of Comms for the potentially successful bid to host the 2015 Eastercon UK Annual Easter SFF convention, I knew a giant 1.1kg bunny at our bid party, or even our bid, could guarantee us the win. Still, I had to stand firm and not disappoint you, dear readers (or Thorntons). 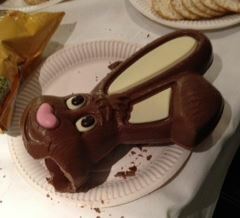 “No,” he said, “the Hotel Chocolat bunny is tasty but not large. This is going to be both tasty and large. I must claim it for the convention” he said. “I must review it” I said “It was not a gift and the expectation is that I’ll review it” I was getting worried now and I was running out of options. 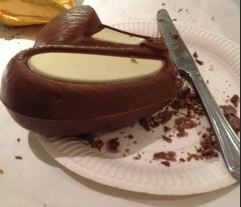 I already knew that the chocolate would be the same silky milk chocolate of the large magnificent egg from last year. This was supposed to be for the office to glory in. I knew it was going to be not too sweet, smoothly milky and yummy. Just like their other milk chocolate Easter creations, this was going to be well balanced and delicious. If he realised that, I was doomed. So there you have it dear readers. I have been forced to look at this bunny for a week. To stare at its magnificent silky exterior and desire it’s cutely delicious ears. It has remained intact – all 1.1kg of it. I’ve mentioned it before in the reviews but I have yet to try it. EDITED TO ADD: Well dear readers – WE WON with is both boon and bane. It means I have to work quite hard at an unpaid position for a year. On the plus side, I creates 50 new Thorntons fans at the party – whoops – just ears left then BOOM! 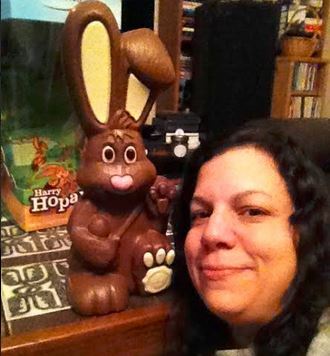 Fostering a chocolate bunny for a week is impressive!